The array in Crowell spreads across the entirety of the stage, a platter of gold and red. Musicians and their instruments cover every inch of the floor. They sit cross-legged, mallets in hand, and they all follow the beat of the drum. But they do not follow any rhythm or tempo. Because in Indonesian music, you follow the whim of the drummer, and the hit of the gong. At the back of the stage, an older woman sits under an awning, next to gongs stretching up to six feet in diameter. When she hits, the reverberations flow languidly all the way to the back of the theater. This is gamelan, the Indonesian ensemble taught by Winslow-Kaplan Professor of Music Sumarsam. This past weekend, gamelan hosted the Indonesian Royal Court of Yogyakarta, including its dancers and musicians. University students got to perform alongside royal musicians in traditional dress, in front of the Sri Sultan Hamengkubuwono X of Yogyakarta himself. Professor Sumarsam has been preparing for this visit for nearly two years, but he has been teaching gamelan at Wesleyan for over four decades. The showcase featured a full gamelan percussion ensemble of drums (kendang), gongs, slenthems, bonangs, and more. In front of the musicians, various royal dancers performed traditional Islamic storylines in ornate masks and costumes. The dances were more narrative-based, resembling theater as much as ceremonial dance. A symposium on Saturday explained the costumes and puppetry in greater detail for the University community. Before the performance commenced, the mayor of Middletown Dan Drew presented Sri Sultan with a key to the city. Connecticut’s Indonesian community, which consists of about 40 to 50 families, also received invitations to the showcase. Professor Sumarsam stressed the visual as well as aural components of gamelan, which lend itself to such an immersive performance. The gamelan course at the University is divided into two sections, Beginners and Advanced. The musicians at Friday night’s performance all take the Advanced class, and practice four hours per week. The students, many of whom only began playing last semester, are part of a larger ensemble of graduate students and Indonesian court members, some of whom have decades of experience in the craft. 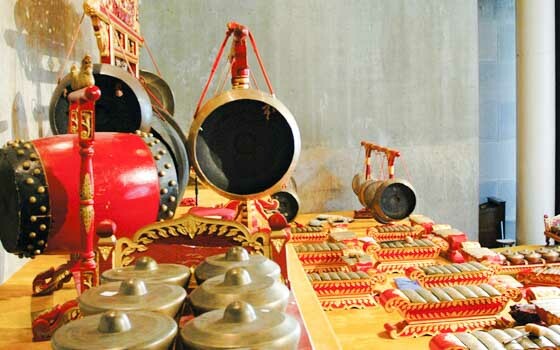 Sumarsam noted that one of the most difficult concepts for students to grasp in Beginners’ Gamelan is the cyclical structure of Indonesian music. Instead of following a linear metric, music circumscribes around the pace of the drum and the cycle of the gong hits, more like a clock. Unlike Western music, Indonesian notation also uses numbers instead of letters and notes. Gamelan itself is a percussion-based ensemble, but the performance on Friday featured several singers and even a small horn section. Because Javanese music follows a cyclical structure, pieces can be expanded or compressed based on exponents of two, to fit whatever time frame or speed is desired. Sumarsam is sure to acknowledge the way cultural idiosyncrasies can shape the way we perceive music, especially Westerners who are accustomed to a different set of standards. “Music doesn’t have a universal meaning because it’s always being constructed in any event, but [viewers] will get some type of aesthetic enjoyment in the music they’ll be hearing and the dancing they see,” he said. The gamelan program in particular was given to the University in 1984 by the court of Yogyakarta. Sumarsam hopes that this showcase in particular would give University students and Middletown residents alike a window into Indonesian culture, but he acknowledges the difficulty of presenting an entire culture to a viewer in just under two hours of performance. Sachs, for one, has been mesmerized by the art form and culture since day one, as well as the teaching style.